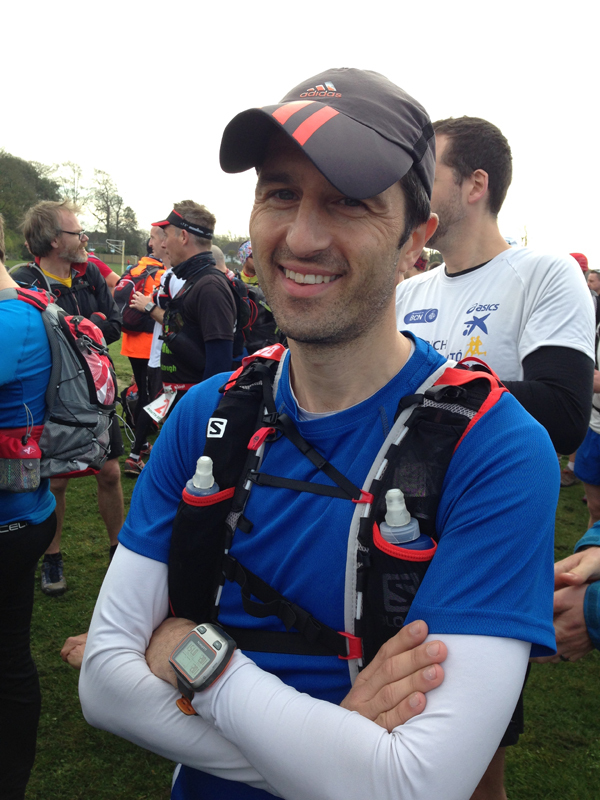 I had entered Centurion Running’s South Downs Way 50 event at the last minute when some additional entries had been opened up. After a pretty poor January (knee injury) and February (man-flu) running wise, March was a good month with some solid mileage (over 400 miles for the month) and I was looking forward to the opportunity to get a decent long run in before the upcoming Thames Path 100. This was coupled with a secondary objective of recce’ing the second half of the South Downs Way 100 before I tackled it in June. I travelled down to the start of the race after a 5.30am departure from home with Michael Sartorious who was sweeping the course today. We arrived, registered and went through the mandatory kit check before I caught up briefly with lots of familiar faces. It almost appeared to be the case of everyone I knew who ran Ultra’s was either helping or taking part today! The plan for the day was a nice steady run at a comfortable pace which wouldn’t upset my weekly running as I have a couple more weeks planned running before the planned taper for the Thames Path 100. I started somewhere near the back as the lead runners set off. The first part of the race leads you up a small path and it was quite amusing to see a few people try and gain a few early places by dashing into a gap, it almost felt like a busy 10k event. I chatted to Dan Park briefly as we headed out for the first mile or two from the start. “Hey, it’s just a training run” pose. It was great to see a real mixture of people taking part from the obvious front-runners haring off to people who were new to the distance. I was a little concerned by a few who started to walk within the first few hundred yards and were looking out of breath up the first slope and thought Michael might be in for a long day completing his sweeping duties. 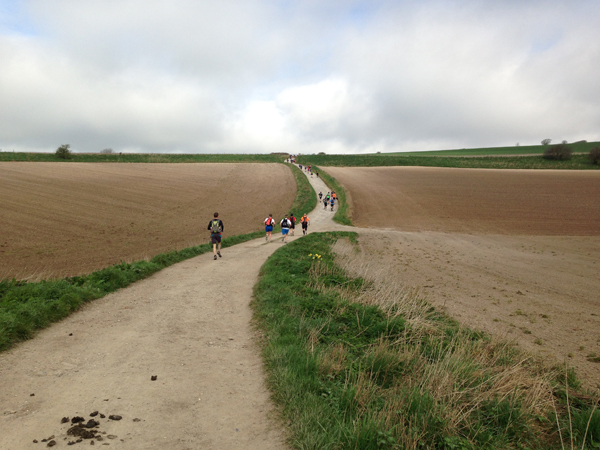 The start saw us head up a hard track path and then onto the South Downs Way. It was cloudy and cool but with no sight of rain (the hat was having a rest day) so good conditions for the run. I ran and chatted with Traviss Wilcox for a while and could see a long trail of runners ahead as we followed the gentle slopes up and down. I bumped into David Hegarty and friend running and we ran a few miles together and chatted although I started to suffer a real pain on the underside of my foot which was pretty uncomfortable which didn’t seem to go away so part of the conversation was with gritted teeth but I didn’t want to start whining before the first checkpoint. The first checkpoint was situated at a layby along the A283 (Botolphs) as the South Downs crosses the road. I grabbed a few snacks, had a couple of cups of coke said hello to Claire and Drew and then had a little walk up the hill after the checkpoint which gave me time to consume the food I had taken. 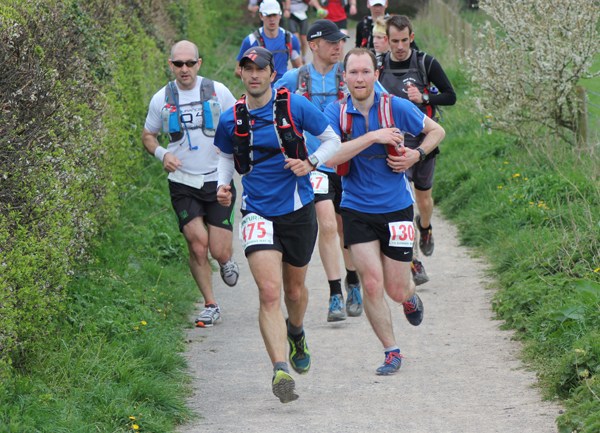 I settled into a further run which led to the second checkpoint at Saddlescombe Farm which was about 5 miles further on and bumped into Sam Robson who was experiencing a few tummy issues and had described his day so far as “I started with 3 buffs and now just have 1”. Sam and I tagged along together for a while sometimes leapfrogging each other for most of the rest of the race and it was good to chat, catch up and talk rubbish which helped pass the time. I kept seeing Mary Heald out supporting (her partner I believe) who must have been running close to me as she kept popping up every few miles along the race providing some support and encouragement. She even saved me 0.5 seconds of time by opening a gate for me, awesome. The next checkpoint was 10 miles from the last one and felt like a long stretch, I was ticking along at about 8.30-9m/m pace when running and slowing for a few hikes along some of the hills and ended up putting on the iPod as I was by myself around this point. Thankfully the pain in my foot had settled down but my feet were feeling a little sore from the hard track path and some loose rocks/stones. I trotted into the third checkpoint at Housedean Farm saying hello to Karen, Sue, Becky and Shaun who were crewing grabbed some more supplies and walked a little while whilst eating some of the food I had taken before plodding on. There always seemed to be a bit of a hill after each checkpoint which suited me fine as it gave me a chance to slow the pace and eat some food without feeling like you were wasting time. The next checkpoint was about 7 miles further on and felt like a long stretch up followed by a long stretch down before arriving at Southease where the slices of melon went down well. 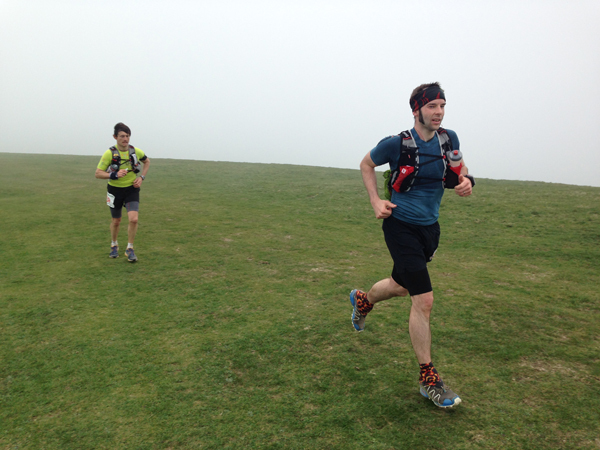 Once again there was a climb after a checkpoint and I caught up with Paul Radford who was running this event only 9 weeks after a knee operation following an injury at the Spine Race. Sam then caught us both up and the three of us ran together for several miles. 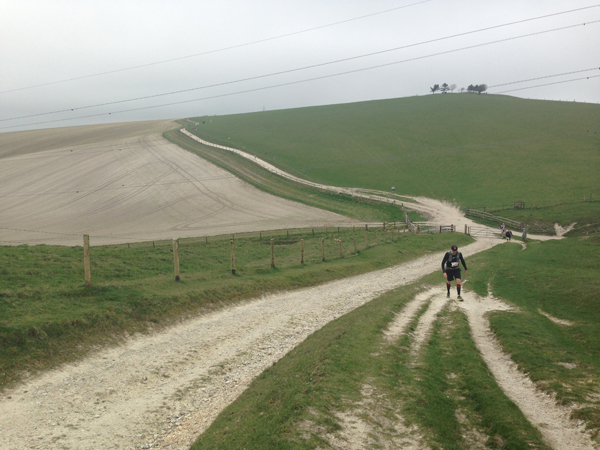 I had never run the South Downs before but found it to be a pretty good route with lots of gentle up and downs with a handful of steeper climbs most of which were runnable if you put the effort in (which I didn’t today!). The three of us chatted and ran as we gained some elevation. We must have hit the highest peak of the Downs as it became misty, cool with a bit of a wind and visibility was reduced. For some reason my Garmin had switched itself off (or I must have hit a button by mistake) and I restarted this. To be honest, I had just kept the Garmin on map mode to ensure I had a simple navigation check and I wasn’t paying a lot of attention to the time but it was looking like an 8hrs 30mins ish finish at this time. I bumped into fellow Fetcheveryone member Dan Gritton and we spoke briefly before arriving at the last aid station which I ran straight through as John Hayden took my number down. There were only a few miles to go so the stop wasn’t necessary. I recall the video of the trig point turn off from the Centurion website giving directions at this end and as we arrived at this point it was really well marked just as Drew Sheffield appeared giving a few words of encouragement to the runners and directing the runners along the correct route. At this point you could see Eastbourne but I didn’t spot the Sports Ground easily and followed the small stony path down a gully off the South Downs and heading towards Eastbourne. Sam and Dan ran on ahead here as they were descending well whilst I took it a bit more steadily, my feet were feeling surprisingly sore but I could maintain a run. The good news was that the rocktape, injinji liner and thin drymax trail sock combination on my feet I had been trying out didn’t result in any blisters which was a bonus. Another runner Geoffrey caught me up as I stopped briefly for a “comfort break” before we entered the built up area of Eastbourne and we trotted the last couple of miles together. This was Geoffrey’s first Ultra I believe and he was pleased with his run but did say he didn’t fancy doing another one (I’m sure he might change his mind after a few weeks). Geoffrey and I chatted briefly as we headed through the streets of Eastbourne towards the finish in the Stadium which actually appeared a little quicker than I expected it to. After a final loop of the track I finished in 8hrs 17mins, which wasn’t a bad time. It was a good long run and exactly what I wanted, the only issue of note was my sore feet everything else was ok. There were lots of familiar faces at the finish and James Adams (he’s just written a book if you didn’t know this which you can buy here) had been charged with handing out the finishing medals. After collecting the medal and t-shirt, I had a plate of chili and bread and then had a shower and got changed before heading back to the start on the coach. It seemed to be a good day out for lots of runners some of who posted some pretty swift times and everyone seem generally pleased with their performances. (Well done to Paul Navesey and Edwina Sutton for their wins). Unfortunately, it started to rain quite heavily after 6pm so I felt a little sorry (briefly) for the other runners still out there before getting back to my car and a long drive home (with a McDonalds stop on the way). 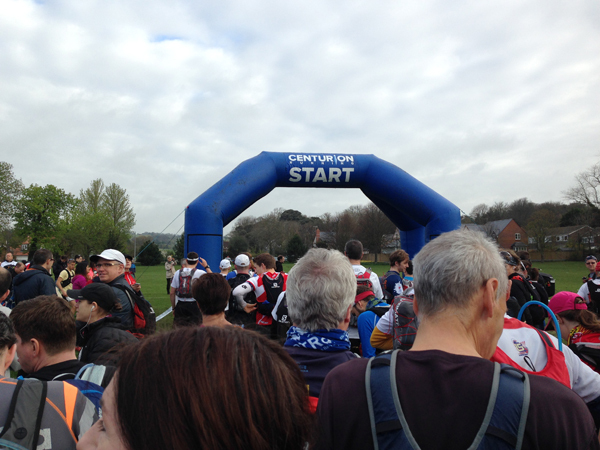 Once again, Centurion delivered a faultless event with 70+ volunteers looking after the 350+ runners taking part. Thanks to James, Centurion team and volunteers for looking after and supporting all the runners.